Kenneth “Ken” Tcheng is the General Manager of Sunny Slope Water Company in the City of Pasadena. Ken has worked for Sunny Slope Water Company since 2008, serving on the company’s Board of Director for 11 years. 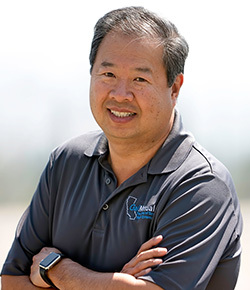 Prior to joining the company, Ken worked in the aerospace industry, managing Information Systems/Information Technology Infrastructure Services. Ken is also a Board Member for the San Gabriel Unified School District, and a Board Member and Past President of the Asian Youth Center Nonprofit Organization. He has served on the CalMutuals Board of Directors since 2014, and is Chairman of the Regulatory Affairs Committee.